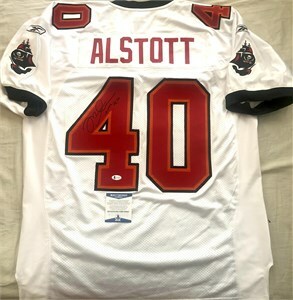 Extremely rare Mike Alstott authentic On Field white game model NFL Equipment jersey made by Reebok with elastic sides and sleeve cuffs, embroidered Buccaneers insignia patch and stitched-on triple layer cloth tackle twill name (on nameplate) and numbers. This is identical to the jersey worn by Alstott for the last few years of his career including the 2002 Super Bowl 37 Championship season except for the size, tagging and customization. NOT AUTOGRAPHED. BRAND NEW, NEVER WORN (NO PAPER TAGS).